Some fullscreen games will change the screen resolution when they start. If the recording started before the game launched, this can cause the recording to stop. 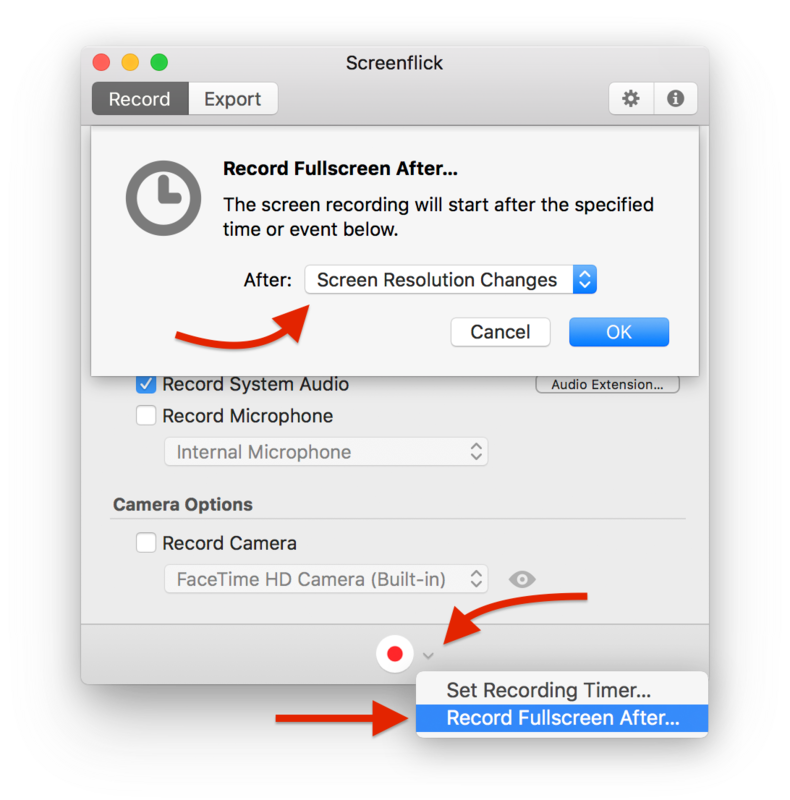 To handle this, use the "Record Fullscreen After…" feature and select when "Screen Resolution Changes". Click on the pulldown menu next to the recording button at the bottom of the main window. Go into fullscreen in the game. After the game changes the screen resolution, the recording will start. If the destination for your recording is a place like YouTube, where the maximum resolution is 1080p (at least for the vast majority of viewers), you can tell Screenflick to limit the recorded video to 1080p, while still playing the game fullscreen at a larger resolution. For example, playing games on a 27" 5K Retina iMac means the screen is actually 5120x2880 pixels. That's huge. 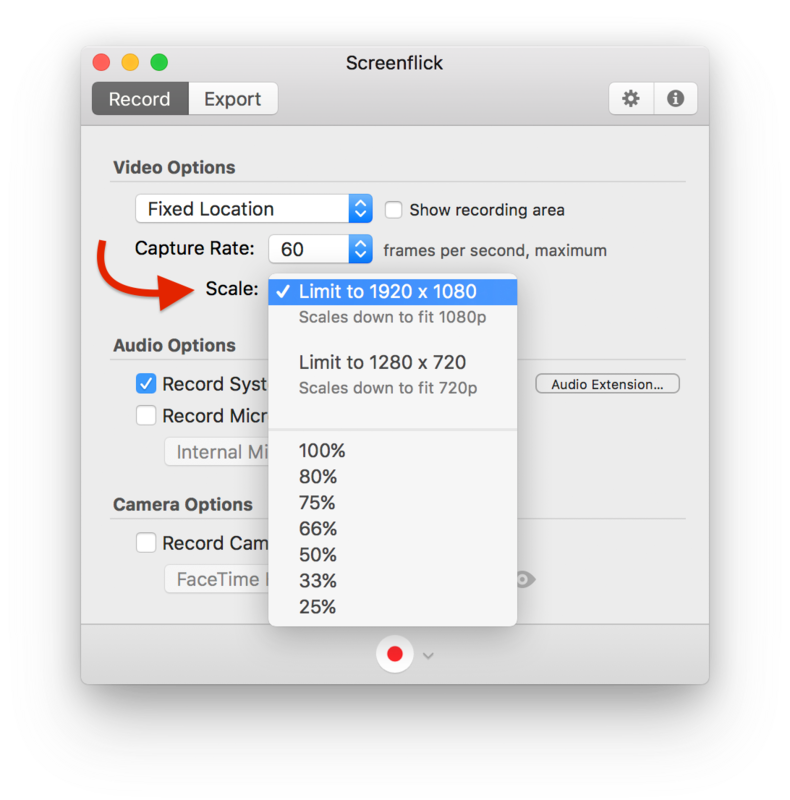 Using the "Scale" option in Screenflick to limit the capture to 1080p will reduce the amount of work Screenflick needs to do by 7x. That will VASTLY improve the recording performance. If you find that your game's performance is lower when recording, lowering the frame rate from 60 fps to 30 fps will make a big difference. Make sure the game has V-Sync turned on. With V-Sync off, the frame rate of the game can go above the maximum of the display (and the chosen recording FPS in Screenflick) which can steal precious CPU and GPU processing power away from Screenflick. It can also cause hiccups in the frame render and capture timing which can result in a "stuttering" effect when playing. Turning V-Sync on will reduce the chance of this happening. Finally, reducing the actual quality of the video game rendering itself can improve recording performance. Remember that both the video game and Screenflick are sharing all of your computer's resources, so some compromises might be necessary to keep both running smoothly. Most games will behave well, but if you encounter a situation where the game's audio wasn't recorded, you may need to slightly change your recording setup, such as starting the recording before launching the game and trimming the recording before exporting.